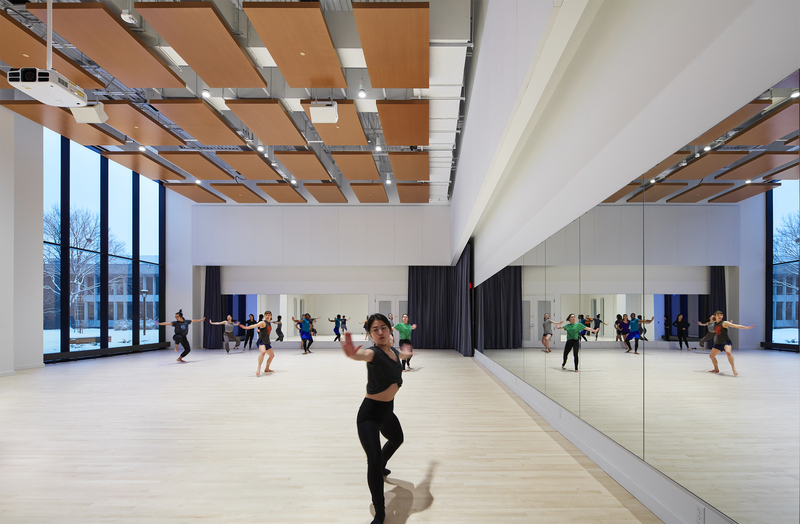 St. Paul, Minn. – The opening of Macalester College’s new Theater and Dance building represents the completion of the final phase of the Janet Wallace Fine Arts Center (JWFAC) renovation. Construction for the $32 million structure began in November 2017 and was completed in January 2019. Like other buildings in the JWFAC, it features an exterior design element suggestive of the art being created within. One of the key changes in the new building is space and how it’s used. The Theater and Dance program now has 7,500 more square feet than the previous building. It’s organized in a logical and efficient fashion that facilitates both pedagogical processes and the artistic production of a wide variety of performance events. The completion of the Janet Wallace Fine Arts Center moves the Theater and Dance Department facilities closer to the Music Department’s Mairs Concert Hall, Law Warschaw Gallery, and the Lowe Dayton Arts Commons. Driven by the College’s dedication to teaching and learning, the new building updates and reimagines what Mac classrooms look like—and how professors use them, something that often wasn’t available before due to architectural design limitations in older buildings. Instead of a traditional proscenium layout, the Theater and Dance faculty chose a flexible performance space featuring hinged galleries that can create different seating and performance configurations for each production. The addition of a tension wire grid high above the flexible theatre—effectively a metal mesh placed above the audience, but below lighting instruments—will allow faculty to safely teach hands-on design and technical theater courses to groups of 15-20 students at a time. A new seminar classroom has been added to this floor. An expanded costume shop with windows that will admit ample natural light, and a scene shop with high ceilings that will allow students to use tools and machines to fully build large production sets before moving them to the flexible theater. Students will use lab areas to work with dye textile, paint wood surfaces, and weld metal structures. The 2,400-square-foot Fox Dance Studio will primarily host dance classes and experiments in digital design technology. The room is equipped with enhanced acoustics, high-quality projectors, and it presents white walls especially treated to serve as optimum projection surfaces. The Fox Studio will support classes ranging from ballet, African-based movement, and physical theater, to pieces that explore the intersection between contemporary performance and digital projections. A new box office and lobby, shared with the Music Department, will open into the Lowe Dayton Arts Commons and serve as a gathering space for Theater and Dance Department patrons and students. One of the building’s more distinctive features is the Schwartz Arts and Sciences Link, a skyway to the Olin-Rice Science Center, providing a physical and symbolic materialization of the core of the liberal arts education: the connection between the Arts and the Sciences. Eight classrooms designed to house classes from all disciplines. Flexible configurations in each classroom—including movable furniture—that will support a wide array of teaching styles. Seating areas throughout the hallway will foster student collaboration and gathering. 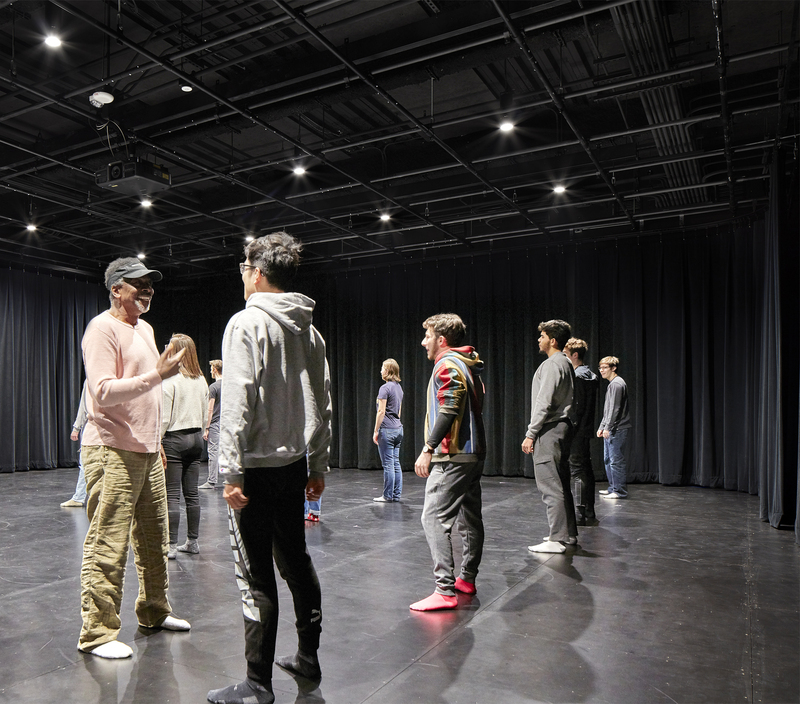 The Huber-Seikaly Theater is a rehearsal studio that can be used as a black-box space for theater, dance, lighting design classes, and demonstrations. The black box studio will be outfitted with a lighting grid, sound, and projection, cutting-edge technology that will allow directing, choreography, design, and acting students to collaborate and push the artistic boundaries in their projects. The Berg Studio is available for dance forms that need a Marley vinyl floor. A design studio equipped with state-of-the-art technology. Two academic classrooms are available. The solar array, a 130-kW system covering the entire roof area. Two storm water-holding areas that will filter building and parking lot runoff rather than sending it directly to the Mississippi River. A large window on the south end with vertical etchings that are both visually attractive and safe for birds. A building envelope expected to provide vastly superior energy performance compared to the previous structure. Architectural plans preserve the building’s interior courtyard and showcase the Isamu Noguchi sculpture that came to Macalester’s campus for the opening of the original Janet Wallace Fine Arts Center building. The JWFAC renovation and expansion began over a decade ago and includes the Music building, an Art Commons, the Law Warschaw Gallery and the Joan Adams Mondale Hall of Studio Art building. The original Janet Wallace Fine Arts Center was dedicated in October 1965. HGA designed this theater and dance building of the JWFAC complex as well as the additional classrooms. The firm was also responsible for the award-winning Music and Art buildings on campus. McGough Construction was the general contractor for all three phases of the JWFAC renovation.